Long weekends and mini-vacations can do wonders for workaholics who find it difficult to get away from it all. So, finding a destination that’s close to home but worlds away is a bonus. 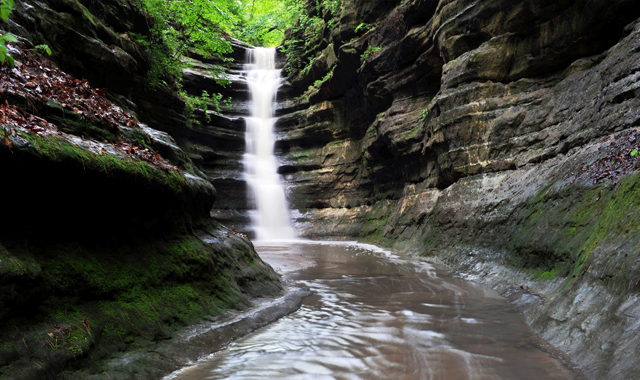 Starved Rock Lodge could be the best choice for your next day trip or overnight stay because it’s nestled in the woods, with the amazing canyons and seasonal waterfalls of Starved Rock and Matthiessen state parks just a few minutes away. Guided hikes are offered every weekend year-round and include a drawstring backpack with lunch. There are several advantages to having a friendly and knowledgeable leader when taking to the trails, especially for first-time visitors. Historic Trolley Tours are offered daily during summer months and are an additional way to learn interesting legends, bits of trivia, and the story behind this National Historic Landmark’s name. Life does move at a slower pace in LaSalle County, but that’s a good thing in today’s frantic world. 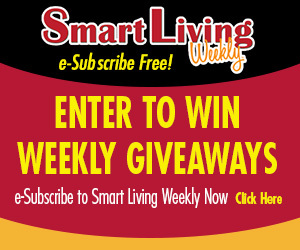 Getting away from your cellphone for a few hours (or days) can be liberating and relaxing. The therapeutic value of a walk in the woods can be better than psychotherapy! If you’re hiking with family or friends, it’s a chance to just talk along the way. Or maybe it’s an opportunity to enjoy being quiet. Either way, the photo opportunities that await you along the trails are sure to make you wonder why you never came here before. Massage therapists are on staff so you can end your day with a stress-relieving experience. Plus, there’s a pool, hot tub and sauna inside the lodge. Hungry after your hike? Starved Rock Lodge offers a variety of options, from the rustic ambience of the Main Dining Room to the sweeping views on the Veranda, where your glimpse of the Illinois River Valley just can’t be beat. Sunday Brunch is a fan favorite, so reservations are necessary. Food service is also available in the Back Door Lounge, Starved Rock Cafe and Trailheads Concessions, located at the Visitor Center. Water cruises on the Belle of the Rock paddlewheel boat run from June through September and offer a slow-paced excursion for guests of all ages. Land & Water Cruises include lunch and are offered on Mondays, Wednesdays and Saturdays. Dinner & Evening Cruises are offered on Mondays and Thursdays. If you’re a history buff, Canal Boat & Trolley Tours are offered May through October and allow guests to step back to 1848, when mule-pulled packet boats were a revolution in travel on the Illinois & Michigan Canal. This tour includes lunch and trolley transportation. On Friday and Saturday nights, there’s free, live music on the Veranda, which is made better by beautiful sunsets over the scenic Illinois River Valley below. Located less than 90 minutes from most Chicago suburbs, Starved Rock is a one-tank getaway that’s worlds away. To learn more or to book a room, call (815) 667-4211 or go to starvedrocklodge.com. 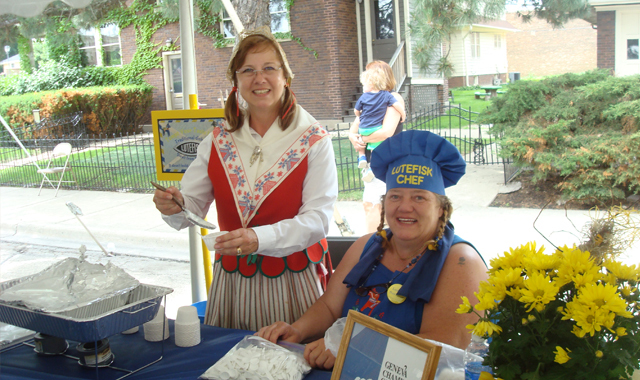 More than 200,000 people are expected to attend Geneva’s popular Swedish Days Festival, happening this year from June 21-26. Dining, shopping and lodging are just half of the experience when visiting Geneva. Downtown, visitors can find historic homes turned into family-owned shops and restaurants, several of which have belonged to families for 50-plus years. Now is a prime time to visit these charming spots, with the weather warming and the city’s 67th Annual Swedish Days Festival right around the corner. Organizers of the six-day festival, which runs from June 21 to 26 this year, expect more than 200,000 visitors to stop by for traditional events and new attractions. The fun continues with a carnival, kids’ activities, free nightly musical entertainment, and merchant sidewalk sales offering “must-have” bargains. Traditional Swedish and favorite American and ethnic foods are available throughout the fest, along with sinfully delicious desserts. Geneva also pays homage to its Swedish influence with Sweden Väst, a tent that has everything Swedish. On the final day of the fest, join 45,000 others in cheering on a grand parade. The event draws not only locals, but also visitors from Sweden. Shortly after Swedish Days, Third Street in downtown Geneva welcomes a celebration of fine art. On July 23 and 24, The Geneva Arts Fair showcases prestigious works of more than 150 fine artists from across the country. This year’s juried show provides visitors with the opportunity to talk directly with the artists about their displays and peruse works done in many media. “As they stroll down Third Street, guests can enjoy art ‘en plein aire,’ and best of all, for free,” Rush says. Rush is proud that her children represent the sixth generation of her family to graduate from Geneva High School. Her roots are in Geneva, and she has no intentions of leaving. To learn more about Geneva’s exciting summer events, visit genevachamber.com. 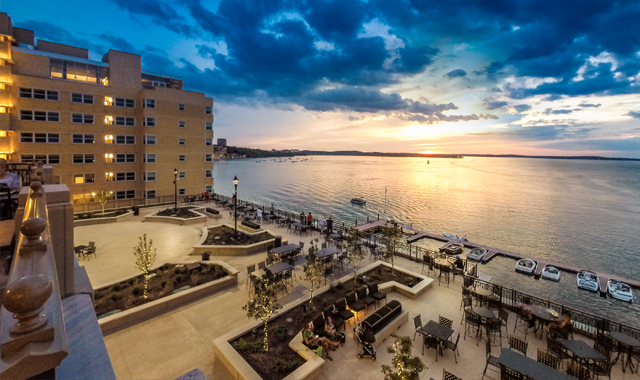 Built along the shores of Lake Mendota, The Edgewater promises waterfront relaxation, breathtaking views and many outdoor activities year-round. The calming waters of Lake Mendota are a beautiful sight to wake up to. The Edgewater, 1001 Wisconsin Place, Madison, Wis., has been offering breathtaking views since its doors opened in 1948. For more than 65 years, The Edgewater has provided guests with waterfront relaxation, al fresco dining and a convenient spot for important meetings. It’s also hosted an array of celebrities including Elvis Presley, The Weekend, Bob Hope, Kristin Chenoweth and the Dalai Lama. Major renovations to The Edgewater, completed in 2014, have taken things to a new level. Located in the heart of the city, The Edgewater is mere steps from the University of Wisconsin-Madison campus and the State Capitol. The vibrant energy from the bustling school and downtown community allows guests to enjoy the “Madison Experience” without ever leaving the hotel property. Also nearby is a plethora of locally owned treasures, from the Madison Children’s Museum to Gail Ambrosius Chocolatier – a haven for exotic, hand-crafted fine chocolates. But with a wealth of amenities right on site, you don’t even need to leave The Edgewater to experience a great getaway. The Edgewater also offers guests a full-service spa experience, from facials and massages to hair care and makeup services. The exclusive treatments and product lines aren’t available anywhere else. A full-service wellness center offers private yoga instruction and group classes. Guests can find delicious dining options without having to leave the premises. The Statehouse serves up finer options, such as seafood and steak, while The Statehouse Bar is a creative, casual experience that offers a protein-driven menu with small plates and a focus on sharing. The Icehouse is a grab-and-go spot that services everyone enjoying the Plaza and The Ice Rink, while The Boathouse, open from 11 a.m. to 11 p.m. daily, offers a waterfront dining option that serves up Wisconsin necessities: cheese curds and craft beer. The Quarry Cable Park & Grille, located inside Crystal Lake’s Three Oaks Recreation Area, delivers a new way to experience the thrills of wakeboarding. Who says you have to drive for hours to get away? Perched between Chicago and Rockford, McHenry County, Ill., and its many communities provide an idyllic backdrop for a brief retreat. Whether you’re eager to spend time by the water or breathe in some fresh country air, you’ll find it. Your weekend getaway begins on Friday evenings at Wonder Lake, along the shores of its namesake body of water. Beginning at 7 p.m., the Wonder Lake Water Show Ski Team takes to the lake as its nearly 120 teammates show off their water ski stunts. Far from an ordinary ski team, this group boasts four national championships. Its performers have skied around the world and represented the U.S. as members of the USA Water Ski Show Team. Graff’s 18- and 8-year old daughters are also part of the family-friendly team. Catch the action for yourself at Center Beach, on Hancock Drive and East Lake Shore Drive. More details are online at wonderlakeskiteam.org. “Bring a blanket, a chair and a cooler, and sit on the beach,” says Graff. Your Saturday adventures begin on the Woodstock Square, where the Woodstock Farmers Market sets up every week. Vendors hail from all corners of the county and its surrounding area, as they serve up fresh treats including produce and honey, cheese, meats and flowers. Because every product is raised or made locally by the vendor, availability depends upon what’s in season. Not far from the square, McCann Berry Farm is now welcoming its strawberry and sugar snap pea season, and preparing for a bounteous blueberry harvest come July. All produce is U-Pick, and although the farm isn’t certified organic, it uses alternate pest control methods with a minimum of pesticide. A little east, at Stade’s Farm and Market, varieties of non-GMO strawberries and raspberries are just coming into season. Come July, you’ll find things like broccoli, sweet corn, potatoes, peppers and tomatoes. 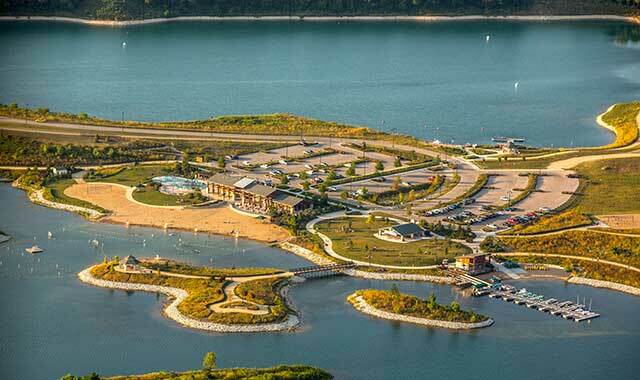 Once you’re scorched by the afternoon sun, head to Crystal Lake and The Quarry Cable Park & Grille, a much-anticipated new attraction at Three Oaks Recreation Area, off U.S. Route 14. This unique attraction on Three Oaks’ North Lake provides an easy way for experienced wakeboarders and beginners to enjoy the sport without a boat. The full-size cable system pulls riders along a cable suspended by a series of six towers. Up to 10 people at a time can zoom along the advanced-rider course, which runs nearly 18 to 21 mph and passes a number of jumps, rails and kickers. The beginner courses offer a more simple back-and-forth ride with assistance from a skilled operator. Riders can buy passes in two-hour, four-hour or all-day increments. Helmets and Coast Guard-approved life jackets are required; equipment rentals are available at the pro shop. Landlubbers have plenty to enjoy at The Quarry’s clubhouse, where they’ll find a fast-casual grill serving comfort food and draft beer, an events room that accommodates up to 50, an outdoor patio with fire pit and two full-sized sand volleyball courts. Because it’s within Three Oaks, The Quarry is accessible to the park’s family-friendly beach, boat rentals and walking trails. “It’s going to be a great summer destination,” says Rinn. For more information on these and other attractions around McHenry County, go to visitmchenrycounty.com. This entry was posted on Wednesday, June 29th, 2016 at 11:56 am	and is filed under Recreation & Destinations. You can follow any responses to this entry through the RSS 2.0 feed. Both comments and pings are currently closed.